For the players that read craps articles and books will sometime come across the concept that certain players are referred to as “Right Bettors” and the other players are referred to as the “Wrong Bettors”. To the uninformed player with the language of craps this can be very confusing to understand. In this game right and wrong are not used in their common sense meanings. A right bettor is not one who is betting correctly or comfortably and a wrong bettor is not one who is going after the chump bets. A Wrong Bettor is not one who is cheating or breaking the rules of the game and a Right Bettor is not one who is playing within the rules of the game. Right and Wrong terms are used in a somewhat of the technical form. So before explaining what this technical form is, it is important to make clear that the game of craps can be understood in its entirety without reference to Right Bettors and Wrong Bettors. Since the associations are being made in craps summary it is better to understand what these terms actually mean. Explaining the concepts is easiest when using an example. The “Pass Line” bet is the more common bet used in a game of craps. The shooter rolls the dice at the beginning of a new come out roll, if the throw is a 7 or an 11 then the shooter automatically wins. Provided that the throw is a 2, 3 or 12 then the shooter automatically loses. Now if the throw is any other number, then that number is considered a point. The shooter wins when they throw the point before a 7. But if the shooter throws a 7 before the point then the shooter loses. Player’s who wager that the shooter will win are called “Right Bettors” and the player’s who bet that the shooter will lose are called “Wrong Bettors”. 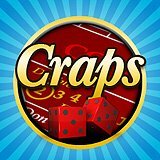 With online craps there is no shooter who rolls the dice but the concept is still the same. An easier way of saying the same thing is that player’s who bet on the pass line bet are called Right Bettors and the player’s who wager on the “Don’t Pass” bet are called Wrong Bettors. The correct term probably got associated with the “Pass Line” bet as a result of most players’ wagering on the “Pass Line” bet as compared to the “Don’t Pass” bet. The concept between Right Bettors and Wrong Bettors are put forward into several other bets in the game of craps. The buy and lay bets are one example. With both of these bets the player pays a commission of 5% to the house in order to get the correct payouts. Player’s who wager on the buy bets are called the Right Bettors and player’s who wager on the lay bets are called Wrong Bettors. Simply because the buy bets win, when the point is rolled before a 7 and the lay bets win when a 7 is rolled before the point. With the come and don’t come bets the same concept is used. Players who wager on the come bets are called Right Bettors and players who wager on the don’t come bets are called Wrong Bettors.